“The airport has performed in an exemplary manner in continuous improvement,” said Michael Trout, MDOT Aeronautics Commission director. Trout presented the award at the 2015 Michigan Airport Conference to Tami Beseau, Chippewa County International Airport manager; Tim Gregory, airport maintenance supervisor; Jim Quinnell, Chippewa County Economic Development Corp. (CCEDC) board member; Tom Ewing, CCEDC president. Beseau credited the airport’s staff for its knowledge and dedication for the success of the airport. This is the 24th year the MDOT Office of Aeronautics has presented the award. 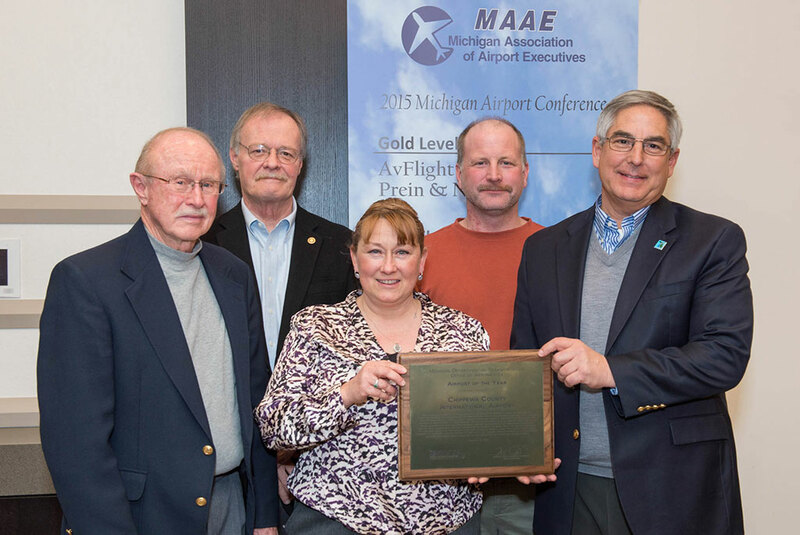 The conference in East Lansing was hosted by the Michigan Association of Airport Executives. Share the post "MDOT names Airport of the Year award"
Categories: Business Announcements and Chippewa County.